The only remaining population of Javan rhinos will be better safeguarded following the quadrupling of video camera traps to monitor the critically endangered animals in Ujung Kulon National Park, Indonesia. 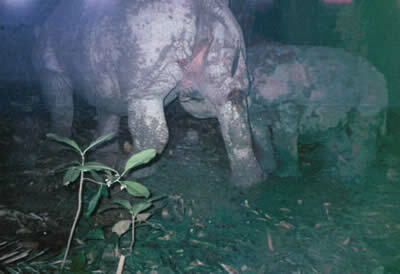 Jakarta – The only remaining population of Javan rhinos will be better safeguarded following the quadrupling of video camera traps to monitor the critically endangered animals in Ujung Kulon National Park, Indonesia. WWF and the International Rhino Foundation (IRF) recently donated 120 cameras to the park, bringing the total number of camera traps to 160. The need to have additional video cameras for rhino observation was first recognized during an IUCN Asian Rhino Specialist Group meeting at Cisarua, West Java in March when the head of Ujung Kulon National Park presented the positive results of Javan rhino identification in 2011, when the park officially began using video camera traps. That year 35 individuals comprising of 22 males and 13 females were identified. Experts believe there are fewer than 50 Javan rhinos remaining. “With the total of 160 video camera traps placed simultanously around the park, we can collect various information, not only on javan rhino but also other wildlife,” said Moh. Haryono, Head of Ujung Kulon National Park Office. The Ministry of Forestry has set up nationwide targets to increase the populations of 14 endangered species by three percent by 2014. The success of this target will be measured by the primary work indicator, a guideline developed by the Directorate General of Forest Protection and Nature Conservation of the Ministry of Forestry. Currently a roadmap is being developed to provide a systematic guideline for all stakeholders to participate. 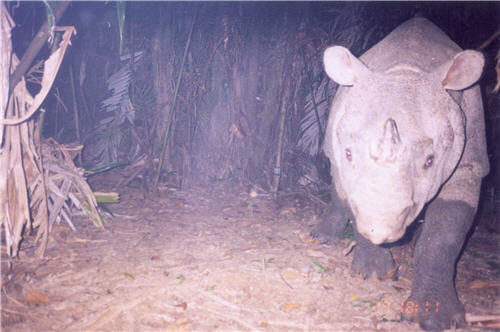 Since the 1990s, WWF has been working with Ujung Kulon National Park to observe the Javan rhino population using camera traps. At that time the park was the first ever in Indonesia to identify wildlife using still photo camera traps. In 2008 video camera traps replaced the photo camera traps. Javan rhino mother and calf taken by a camera trap at Citadahan watershed in Ujung kulon National Park. Indonesia. Javan rhinoceros photographed by a camera trap, Ujung Kulon National Park, Java, Indonesia.